Instant Archive Viewer from Instant Technologies gives organizations the ability to monitor and archive conversations on OCS 2007 for policy enforcement and regulatory compliance. 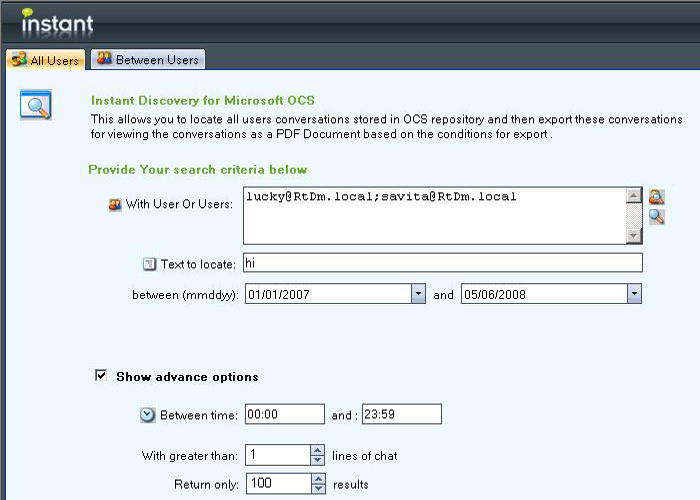 Instant Archive Viewer from Instant Technologies provides instant messaging (IM) search and discovery for Microsoft Live Communications Server (LCS) and Office Communications Server (OCS) 2007. Instant Archive Viewer enables organizations to monitor and audit conversations on either LCS or OCS 2007 for internal policy enforcement and/or external regulatory compliance. It converts the contents of your LCS/OCS archives into a usable business asset and offers users access to past conversations as either a reference or a business tool. End users working on Instant Archive Viewer can access simplified searching of personal archives and can save chats as .PDF files. 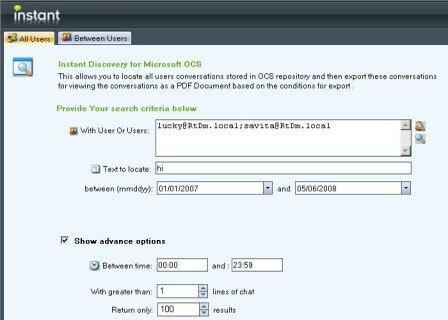 The tool also integrates with the Office Communicator client. Immediate access on either LCS or OCS, without involving the help desk. Fully indexed archives that offer advanced searches with Boolean operations, within time frames or over a set conversation length. Instant deployment, without any software installed on the client. System requirements: Microsoft Visual Studio; .NET Framework 2.0; SQL Server 2000 SP4 or SQL Server 2005 SP1; Internet Explorer 6.0 or higher; OCS Server 2007 with Archiving Services. Pricing: Licensed by the number of OCS servers and number of users. Pricing starts at $2,900 for one server and 25 user licenses.